Thermotherapy is the use of superficial heating that is most commonly used in sub-acute and chronic conditions to reduce pain and relax muscle tissues. Heat increases the dilation of blood vessels which improves circulation and encourages the removal waste at the injury site. Thermotherapy is usually not used until the sub-acute or chronic stages and after majority of edema, or swelling, is reduced. Indications for heat therapy include the following: Pain, sub-acute sprains and strains, muscle guarding and spasm, sub-acute and chronic inflammation, sub-acute edema and contusions, decreased range of motion, and trigger points. Analgesic effect, or a decrease in pain sensation by changing the sensation signal that the nerves are conducting. Vasoconstriction, which reduces further inflammation and damage after an injury by slowing blood flow. A decrease in cellular metabolism and the accumulation of edema. Electrical currents can create three types of physiological responses when applied to tissue. These responses are thermal, physiologic, and/or chemical. All tissue rises in temperature when an electrical current passes through it. Electrical currents can also produce a muscle contraction and alter pain impulses at the nerve level. Pain sensations warn us that a tissue is being injured or has already been injured. Pain helps us modulate activity and is reduced when modalities including electrical stimulation are applied. 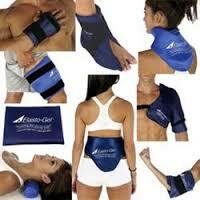 Electrical stimulation is applied by placing electrical stimulation pads on the area of involvement. The amount of electricity is based on the frequency, or number of pulses per second, intensity, or strength of the current, and duration, or length of time the electricity is applied. 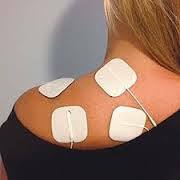 Indications for Electrical Stimulation include the following: acute or chronic pain, increased circulation, muscle strengthening, re-education/prevention of atrophy, tissue/fracture healing, and muscle spasms. Ultrasound is a commonly used modality that can have both diagnostic and therapeutic effects. In the chiropractic setting, ultrasound is used for its therapeutic effects. Inside the sound-head on an ultrasound unit is a crystal that converts electrical energy into acoustic energy. This acoustic energy (sound waves) is able to pass through liquid and solids, allowing it to travel deep into the soft tissue. The physiological effects of ultrasound include the following: increased blood flow, reduction of stiffness and spasm, increase in flexibility of tendon and joint capsules, and decrease in pain. Indications for Therapeutic Ultrasound include: sub-acute or chronic injuries, scar tissue, bursitis, tendonitis, tendonosis, and plantar warts. The term laser stands for light amplification of stimulated emissions of radiation. Light energy is made up of particles called photons. 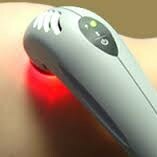 The action of these photons is what creates the therapeutic benefits of lasers. There are three main qualities that make laser light different from other forms of light. These qualities are monochromaticity, coherence, and collimation. They allow the laser to focus a very precise, uniform beam at a specific target. Monochromaticity is when all the photons have a uniform wavelength and color. Coherence is when all the photons have the same wavelength and all of the light waves are in phase with each other. Collimation is when there is little divergence, causing a beam of light. There are many types of lasers, but the most common laser used in the chiropractic setting as we have here is called a low-level, or cold laser. Low-level (cold) laser are most commonly used for wound healing, pain reduction, inflammation reduction, bone healing, and scar tissue. The ETPS (Electro-Therapeutic Point Stimulator) Unit safely detects treatment points on the surface of your skin, then applies concentrated micro-stimulation to motor, trigger and acupoints for a fast, intensified healing response. Traditional acutherapy and trigger point needling have been scientifically proven to release natural pain relievers. The ETPS has been designed to evoke the very same beneficial response, “tapping” into our body’s own internal pain relieving system. The ETPS Unit also has a feature which allows the user to either increase or decrease circulation to the area of injury through a polarity reversal. Decreasing circulation setting is similar to cryotherapy, and is most beneficial for pain control and reduction of swelling. Increasing circulation setting is similar to heat therapy and is most beneficial for immune enhancement and neural regeneration. 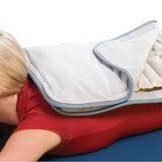 Helping to reduce or increase the blood flow to the area greatly contributes to the natural healing process.